Barry Menikoff’s edited reading transcription of the MSS of David Balfour/Catriona has just been published by the Huntington Library Press at the affordable price of $35. At the moment of writing it is not available either through the Library’s online shop or through Amazon but doubtless it will arrive there shortly. Barry Menikoff will be talking about the book at California venues in early April. Attendees will learn how English publishers in Stevenson’s time took liberties with original texts, excising many of the Scottish words and phrases Stevenson used to evoke the suspense of his stories. From simple misreadings to deliberate revisions, subsequent printed editions of both “Kidnapped” and “David Balfour” represented major departures from Stevenson’s handwritten text. For this edition, however, “David Balfour” is based on Stevenson’s final manuscript of the novel, now in the Houghton Library at Harvard. Faithful to the author’s intentions, it incorporates passages that were omitted from previous editions and restores his distinctive language. 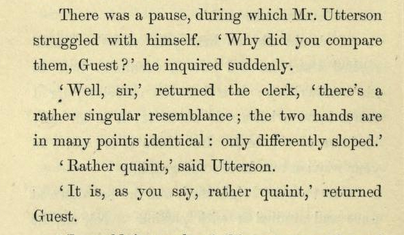 Utterson’s immediate deduction is that Jekyll has forged the first note to protect his ‘protégé’ Hyde; only later do we learn that Jekyll and Hyde can both write in the hand of the other. When Stevenson started to write in a sloping hand in the early 1880s he says he has been ‘obliged’ to do so by writer’s cramp and calls the new style ‘the hand of Esau’ (L8, 417), a description which is interesting because of the affinities between Hyde and the hairy-handed Esau. But (reluctantly) leaving aside any tempting reflections of Stevenson’s life in his work, let us look in more detail at this writing. What follows is intended as a resource that may help in the dating of manuscripts. Note that I have not been able to reproduce these samples to scale as libraries supply images of MSS without a guide to actual size: I have, however, tried to give an approximate relative size to folio, quarto and letter-paper examples. The size and clarity are perhaps the best clues here to an early hand and also the looped-y, and the rounded ‘r’ in ‘armed’, not like the familiar inverted-v as we find it later and also in ‘travel’ in the same line. 8. Edinburgh Journal 1872: 4 folios of an occasional diary of six entries (May, July 1872). Sold at Sotheby’s, New York, 2 December 2014, Lot 138. In example 8, he may have been influenced by the clerkly hand he would have to write in the an Edinburgh law firm of Messrs. Skene and Peacock, Writers to the Signet, where he was working for a brief period at this time. The double-s digraph (of ‘Miss’) and the size (and clarity) again shows an earlier hand. (I have also noted the digraph in MSS from 1868 and 1870; I admit, also in notes for an essay c. 1890 ‘An Onlooker in Hell’ but only for the title ‘Miss’, also seen on envelopes—and my suggestion is that it remained in that use only; certainly I have not noted it in MSS in other words in documents except those definitely dated before 1872). This seems to be a temporary switch, which any writer might make in personal notes, to rest the hand by using a different set of hand muscles. 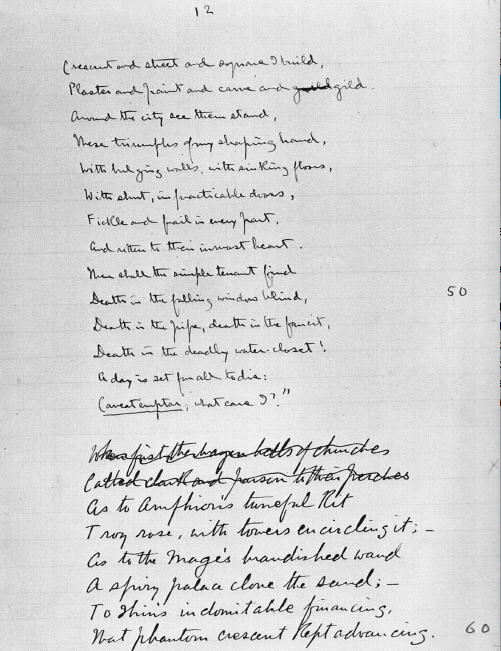 In the following example from a fair-copy manuscript of 1875, the writing has become distinctly smaller. Stevenson here seems to be making an effort to write well, shown I think by the carefully looped ‘y’ in the first and second lines. For a period in the 1880s, Stevenson, suffering from writer’s cramp, adopted a distinctive, often larger, style of handwriting sloping to the right. He first mentions the new handwriting in a letter of March 1883: ‘You see I have changed my hand. I was threatened apparently with scrivener’s cramp, and at any rate had got to write so small the revisal of my MS tried my eyes’ (Letters 4, 251). Here, the reference to very small handwriting seems to fit the ‘Talk and Talkers’ MS above. In March 1884 he again refers to the new hand: ‘I have been obliged to lean my hand the other way, which makes it unrecognisable; the hand is the hand of Esau’ (Letters 8, 417; see example 3. above); and again in July 1885: ‘I have two handwritings’ (Letters 5, 122). Both these styles have an unlooped-y. Again, final-y in both parts is without a loop. The handwriting shows that he did not start rewriting the essay in 1879 but some time in the period associated with this handwriting, i.e. 1883-88.